Orthodox Tewahedo is the common and historical name of two independent Churches of Oriental Orthodoxy within Christianity; these are the dominant faiths in Eritrea and Ethiopia. Until 1959, the Orthodox Tewahedo were administratively part of the Coptic Orthodox Church of Alexandria. That year, the Ethiopian Orthodox Tewahedo Church was granted autocephaly and its own Patriarch by Coptic Orthodox Pope Pope Cyril VI of Alexandria. Following the independence of Eritrea from Ethiopia in 1993, the Eritrean Orthodox Tewahedo Church was made autocephalous by Pope Shenouda III of Alexandria and it officially separated from the Ethiopian Orthodox Tewahedo Church. Tewahedo (Ge'ez: ተዋሕዶ täwaḥədo) is a Ge'ez word meaning "being made one" or "unified". This word refers to the Oriental Orthodox belief in the one single unified nature of Christ; i.e., a belief that a complete, natural union of the Divine and Human Natures into One is self-evident in order to accomplish the divine salvation of humankind, as opposed to the "two Natures of Christ" belief (unmixed, but unseparated Divine and Human Natures, called the hypostatic union) which is held by the Catholic Church and the Eastern Orthodox Church. According to the Catholic Encyclopedia article on the Henotikon, around 500 bishops within the Patriarchates of Alexandria, Antioch and Jerusalem refused to accept the "two natures" doctrine decreed by the Council of Chalcedon in 451, thus separating themselves from the main body of the Christian Church at the time, which would later itself split in two factions (Eastern Orthodox and Catholic) in the East–West Schism of 1054, although this later event was not about Christological views. Oriental Orthodoxy, which today includes the Coptic Orthodox Church of Alexandria, the Armenian Apostolic Church, the Syriac Orthodox Church, the Malankara Orthodox Syrian Church, the Ethiopian Orthodox Tewahedo Church, and the Eritrean Orthodox Tewahedo Church, are referred to as "non-Chalcedonian", and, sometimes by outsiders as "monophysite" (meaning "One Single Nature", in reference to Christ). However, these Churches themselves describe their Christology as miaphysite (meaning "one united nature" in reference to Jesus, the Greek equivalent of "Tewahedo"). The passage continues by describing how Philip helped the Ethiopian treasurer understand a passage from Isaiah that the Ethiopian was reading. After the Ethiopian received an explanation of the passage, he requested that Philip baptize him, and Philip did so. The Ethiopic version of this verse reads "Hendeke" (ህንደኬ); Queen Gersamot Hendeke VII was the Queen of Ethiopia from ca. 42 to 52. Orthodox Christianity became the state religion of the Kingdom of Aksum under Ezana of Axum in the fourth century through the efforts of a Syrian Greek named Frumentius, known to the churches' followers as Abune Selama, Kesatē Birhan "Father of Peace, Revealer of Light". As a youth, Frumentius had been shipwrecked with his brother Aedesius on the Eritrean coast. The brothers managed to be brought to the royal court, where they rose to positions of influence and converted Emperor Ezana to Christianity, causing him to be baptised. Ezana sent Frumentius to Alexandria to ask the Patriarch, Athanasius of Alexandria, to appoint a bishop for Ethiopia. Athanasius appointed Frumentius himself, who returned to Ethiopia as Bishop with the name "Abune Selama". From then on, until 1959, the Coptic Orthodox Pope of Alexandria, as Patriarch of All Africa, always named a Copt to be Abuna "archbishop" of the Ethiopian Orthodox Church. Union with the Coptic Church continued after the Arab conquest of Egypt. Abu al-Makarim records in the twelfth century that the patriarch always sent letters twice a year to the kings of Abyssinia (Ethiopia) and Nubia, until al-Hakim bi-Amr Allah of the Fatimid Caliphate stopped the practice. Patriarch Cyril II of Alexandria, the 67th patriarch, sent Severus as bishop, with orders to put down polygamy and to enforce observance of canonical consecration for all churches. These examples show the close relations of the two churches concurrent with the Middle Ages. In 1439, in the reign of Zara Yaqob, a religious discussion between Abba Giyorgis and a French visitor had led to the dispatch of an embassy from Ethiopia to the Vatican. The period of Jesuit influence, which broke the connection with Egypt, began a new chapter in Church history. The initiative in the Catholic missions to Ethiopia was taken not by Rome, but by the Kingdom of Portugal, as an incident in the struggle with the Muslim states of the Ottoman Empire and Adal Sultanate for the command of the trade route to India by the Red Sea. In 1507 Mateus, an Armenian, had been sent as an Ethiopian envoy to Portugal to ask for aid against the Adal Sultanate. In 1520 an embassy under Dom Rodrigo de Lima landed in Ethiopia (by which time Adal had been remobilized under Ahmad ibn Ibrahim al-Ghazi). An interesting account of the Portuguese mission, which lasted for several years, was written by Francisco Álvares, the chaplain. Later, Ignatius of Loyola wished to take up the task of conversion, but was forbidden. Instead, the pope sent out João Nunes Barreto as patriarch of the East Indies, with Andrés de Oviedo as bishop; and from Goa, envoys went to Ethiopia, followed by Oviedo himself, to secure the king's adherence to Rome. After repeated failures some measure of success was achieved under Emperor Susenyos I, but not until 1624 did the Emperor make formal submission to the pope. Susenyos made Catholicism the state religion but was met with heavy resistance by his subjects, and the authorities of the Ethiopian Orthodox Church, and eventually had to abdicate in 1632 to his son, Fasilides, who promptly restored the state religion to Ethiopian Orthodox Christianity. He then expelled the Jesuits in 1633, and in 1665, Fasilides ordered that all Jesuit books ("Books of the Franks") be burned. In the 1920s the Italian colonial power in Eritrea started the first attempts to found a separate Eritrean Orthodox Church. Until then, the Orthodox Church in Eritrea was practically part of the Ethiopian Church, with a strong link to Aksum in Tigray Province as the traditional centre of the Church structure. This was, however, against the interest of the colonizer: Eritrea as a separate colony was supposed to have a church independent from the neighbor's influence, in order to be fully integrated into the colonial system. The separate Eritrean Church was short-lived. When it was still not fully established, the Italians invaded Ethiopia in 1935, and then formed a unified territory called Italian East Africa encompassing Eritrea, Ethiopia and Italian Somalia. Eritrea was unified with the northern Ethiopian Tigray Province and both Churches unified. This unification remained valid even after the defeat of the Italians and their loss of the whole territory in 1941. The Ethiopian Church was granted autocephaly from the Coptic Church by Pope Joseph II of Alexandria, head of the Coptic Orthodox Church of Alexandria in 1950. At that time Eritrea was a separate colonial territory under British administration, but nevertheless the Church in Eritrea was simply made a division of the Ethiopian Church, as the British had no interest to strongly separate the Eritrean Highlands from the Ethiopian Highlands, corresponding to their politics of unification of the highlands (with the option of separation of the Muslim lowlands of Eritrea and their inclusion into Anglo-Egyptian Sudan). 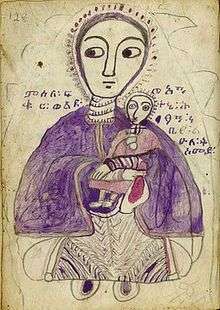 Drawing of Mary, mother of Jesus 'with her beloved son' in pencil and ink, from a manuscript copy of the Weddāsē Māryām ("Encomium of Mary") circa 1875. The Narrower Canon contains the Book of Enoch, the Book of Jubilees, and I II III Meqabyan. (These are unrelated to the Greek I, II, and III Maccabees with which they are often confused.) The canonical Book of Enoch differs from the editions of the Ge'ez manuscripts in the British Museum and elsewhere (A-Q) used by foreign scholars (Old Testament Pseudepigrapha), for example in treatment of the Nephilim of Genesis 6. The current 81 book version was published in 1986, containing the same text as previously published in the Haile Selassie Version of the Bible, only with some minor modifications to the New Testament translation. Some sources speak of the Broader Canon, which has never been published as a single compilation but is said to include all of the Narrower Canon, as well as additional New Testament books said to have been used by the early church: two Books of the Covenant, four Books of Sinodos, an Epistle of Peter to Clement—also known as "Ethiopic Clement," and the Ethiopic Didascalia Apostolorum. These may not all bear close resemblance to works with similar titles known in the west. The Josippon, an eight-part Ethiopic version of the history of the Jewish people known as the Pseudo-Josephus, is considered part of the broader canon, though it would be considered an Old Testament work. Following the independence of Eritrea from Ethiopia in 1993, the newly independent Eritrean government appealed to Pope Shenouda III of the Coptic Orthodox Church of Alexandria for autocephaly. Tensions were high between the Ethiopian and the Eritrean Churches, and no representative from the Ethiopian Church attended the official recognition of the newly autocephalous body. However, the Ethiopian Church has recognized the autocephalous status of the Church of Eritrea although it objected to the method in which the Coptic Church went about granting it. Eritrea's first two Patriarchs were originally Archbishops of the Ethiopian Orthodox Tewahedo Church, and the first Patriarch, Abune Phillipos did visit Addis Ababa during joint efforts by the two Churches to explore a possible resolution to a border conflict that had broken out between the two countries in 1998. The two churches, remain in full communion with each other and with the other Churches of Oriental Orthodoxy, although the Ethiopian Church, along with the Coptic Orthodox Church have not recognized the deposition of the third Patriarch of Eritrea, and the enthronement of the fourth Patriarch, Abune Dioskoros. The first Patriarch of Eritrea was Abune Phillipos, who died in 2004 and was succeeded by Abune Yacob. The reign of Abune Yacob as Patriarch of Eritrea was very brief as he died not long after his enthronement and he was succeeded by Abune Antonios as third Patriarch of Eritrea. Abune Antonios was elected on 5 March 2004, and enthroned as the third Patriarch of Orthodox Tewahedo Church of Eritrea on 24 April 2004. Shenouda III presided at the ceremony in Asmara, together with the Holy Synod of the Eritrean Orthodox Church and a Coptic delegation. ↑ "Catholic Encyclopedia: Henoticon". Newadvent.org. 1910-06-01. Retrieved 2014-06-03. ↑ "The Bible". Ethiopian Orthodox Tewahedo Church. Retrieved 23 January 2012. ↑ Cowley, R.W. (1974). "The Biblical Canon Of The Ethiopian Orthodox Church Today". Ostkirchliche Studien. 23: 318–323. Retrieved 21 January 2012.